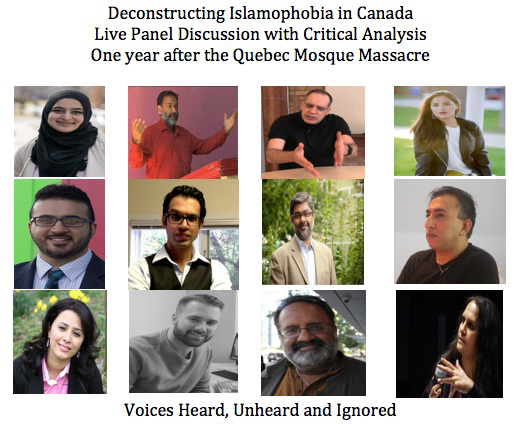 On today’s program we broadcast a second group of voices from the Deconstructing Islamophobia in Canada panel discussion with critical analysis – One Year after the Quebec Mosque Massacre. Produced by Alnoor Gova. 03:00 Ava Homa – celebrated writer, journalist, and political analyst specializing in women issues and Middle Eastern affairs. Zool Suleman @canadavisalaw Immigration Lawyer recently awarded the title of “Queen’s Counsel”, by the Attorney General of British Columbia for his contributions to the law, Zool is a co-founder of the Islamophobia Hotline in BC and publisher of Rungh Magazine. 30:00 MUSIC: M.I.A. – Ali R U OK? 34:00 Sabreena Ghaffar-Siddiqui – a doctoral candidate researching the immigrant experience, including race/ethnicity and identity and issues relating to immigrant/refugee integration, racism, Islamophobia. Postering Peace – above link – does this work? White Americans are a bigger threat – Same in Canada?